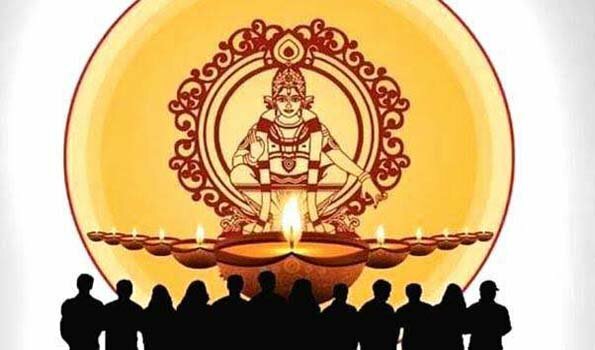 Thiruvananthapuram: As many as 10 lakh people are expected to join 'Ayyappa Jyothi' -- lighting of lamp from Hosangadi to Parassala, in a 795-km stretch across Kerala -- here on Wednesday evening. Creating awareness among the people to protect the customs and traditions of Lord Ayyappa temple in Sabarimala, the Sabarimala Karma Samithi organised confluences in 12 other states also. Devotees will join the confluence from Hosangadi to Angamali at National Highway, and from Angamaly to Moovattupuzha at M.C. Road. Swami Yogendra Saraswathy will hand over lamp in Hosangadi while actor-turned politician Suresh Gopi will do the same in Kaliyikkavila. Devotees will line up on the roadside from 1630 hrs and lit the lamp at 1800 hrs. The Ayyappa Jyothi will end with 'Saranam Ayyappa' chants. BJP State president P S Sreedharan Pillai will light the lamp in front of the State Secretariat here where party's general secretary Sobha Surendran is staging a hunger strike which completed seven days. Devotees will line up holding lamps from Kerala's northern district Kasaragod to Kanyakumari in Tamil Nadu, sources said. Meanwhile, CPI (M)-led Left Government also called for the formation of a 'Women Wall' on January 1 as part of renaissance movement to protect the religious rights of women.